The Associated Press has signed a deal with North Korean state television that gives it exclusive rights to high-definition video of major news events in the country. The deal comes as AP and its biggest competitor, Reuters, race to expand their access to North Korea ahead of the 100th anniversary of Kim Il Sung’s birth — an event that is expected to see large scale celebrations and events in Pyongyang around April 15. The new deal lasts three years and makes London-based APTN (Associated Press Television News) “the only agency to transmit broadcast-quality HD pictures of key news events in North Korea,” it said. The pictures will come from North Korean state broadcaster KRT with which AP already has an agreement to redistribute its video to AP member TV stations worldwide. 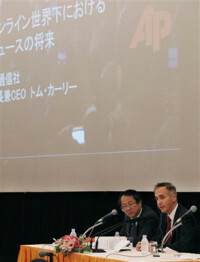 AP President Tom Curley announced the deal in Tokyo on Thursday (pictured, right). For day-to-day coverage it gives APTN a leg up on Reuters TV, which has access to standard definition video footage from KRT and state news agency KCNA. Competition between AP and Reuters to supply footage to TV stations is fierce and the new deal could give APTN an advantage, especially in countries like Japan where demand for footage is high and most broadcasters want HD pictures. Additionally the deal gives APTN exclusive rights to provide high-definition video feeds for all news broadcasters wishing to transmit from the country. That means any TV station wanting to send a high-definition live shot from the DPRK will have to use AP’s services. That could mean big money in 2012 if the DPRK opens its doors to foreign TV stations. The deal builds on a relationship between APTN, KRT and the DPRK’s Ministry of Posts and Telecommunications that began in 2006 when AP opened the first western TV news bureau in Pyongyang.